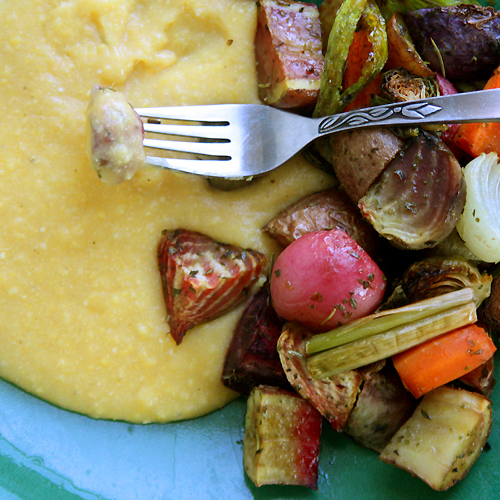 Fall is the perfect time of year to enjoy seasonable roasted vegetables with creamy polenta. 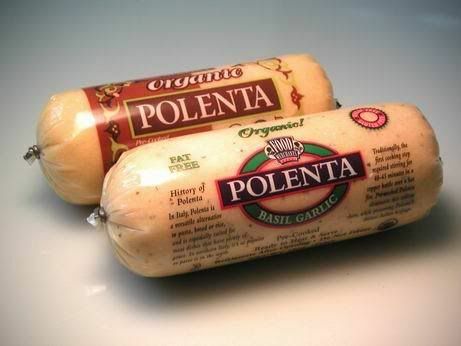 Polenta is just the Italian word for grits, or perhaps the even less glamorous sounding corn mush. I’m not sure why I came to polenta so late in life. Perhaps because I have a predominately German heritage and not Italian or even Southern. Or perhaps it was my less than stellar experiences with “tube polenta” or the grits we were served with maple syrup for breakfast in Savannah, GA. I guess I should be grateful I gave polenta a chance at all. 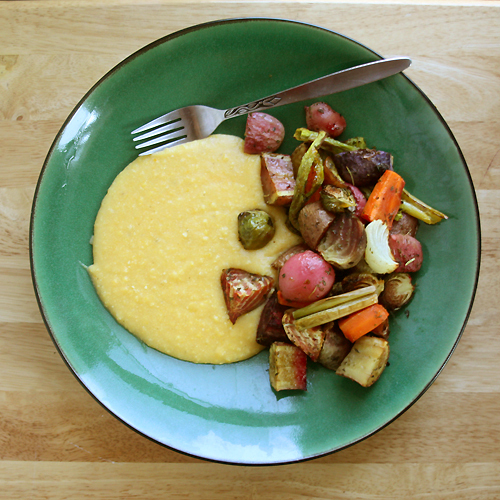 Soft polenta is the perfect accompaniment to roasted veggies. I've got a great assortment of vegetables from the farm. There's leeks, banana peppers, Brussels sprouts, onions, potatos, beets, carrots and something I've never tried roasting before radishes. We had a ton of radishes that were getting overgrown. I'd never thought to do anything but eat them raw, so I looked on tastespotting.com for ideas for radishes and saw that folks were roasting them. They are actually quite delicious. They are sweeter and the peppery bite isn't as pronounced. It's a nice way to use the radishes. It's good to try new things. I believe our first attempts at polenta included a recipe that ended with a can of black beans and salsa on top. It was one of those “30 minute meals” that yes was quick, but wasn’t very satisfying. In our kitchen, who gets the credit for discovering polenta remains up for debate. I pretty sure it came out of a Weight Watchers recipe I tried and Jeff thinks he found it while researching quick dinners. However, we both agree it should be in regular rotation on our fall and winter menu. Start by boiling your broth then when you add the cornmeal, reduce the heat to the lowest possible setting on your stove. This keeps the polenta from bubbling and splattering hot cornmeal goo all over you and your stove top. Stir the mixture vigorously at least every 5 minutes and make sure to scrape the edges and bottom of the pan. Your polenta won’t be lumpy or burn to the bottom of the pan. 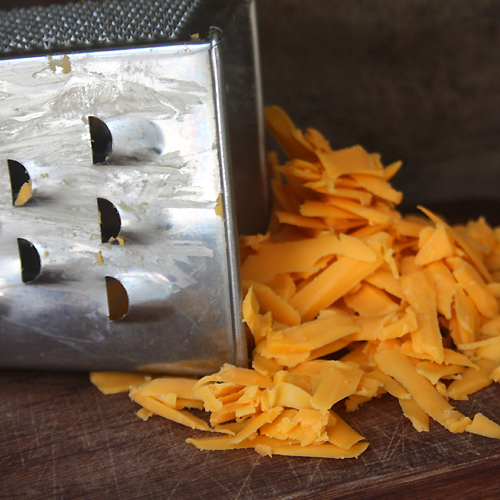 Don’t use pre-grated cheese. To keep the cheese from sticking to itself at the end of processing it gets dusted with some sort of powder that also makes it melt unevenly. Get a block of cheddar and do the 30 seconds of grating to get nice and creamy polenta. 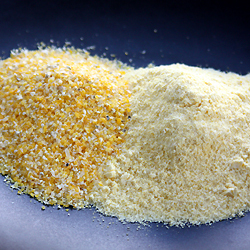 We like a combination of coarse and fine ground cornmeal; not too pasty, not overly textured. About 1/3 coarse Bob Red Mills to 2/3 corn maza is our favorite ratio. Once the vegetables are in the oven roasting begin making the polenta. In a large sauce pan bring 3 cups of stock to a boil. In a medium bowl combine the two corn meals with 1 cup room temperature broth. Use a fork or whisk to combine to stir the mixture until the corn meal is no longer lumpy. Reduce the broth to low. Slowly pour the cornmeal mixture into the hot broth stirring as you go. Cook and stir over low heat for 10-20 minutes, stirring vigorously every 5 minutes. How long you cook will depend on your coarsest corn meal. Taste your polenta, when it is creamy and no hard bits remain, stir in cheese. Check the consistency. The polenta should slowly fall from the spoon. If it is too think add a little water until the desired consistency is achieved. The polenta will thicken-up as it cools. Let the polenta set 5 minutes and then serve. Clean and cut your veggies into roasting chunks. Divide them into two groups. 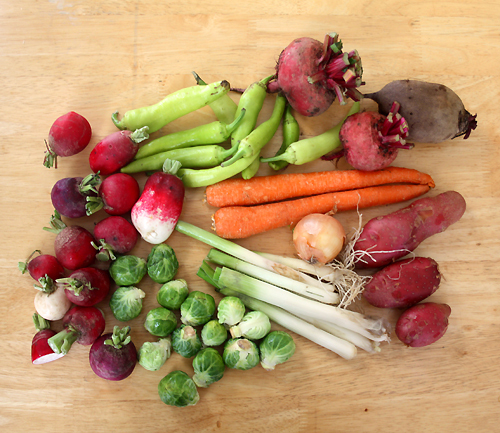 The veggies that roast quickly like onions, leaks, Brussels sprouts, and peppers; and the group that will need more time like potatoes, beets, radishes, and carrots. In a large bowl combine the ingredients that take a short amount of time to roast and add half the olive oil and spices. Give it a couple quick stirs to combine. 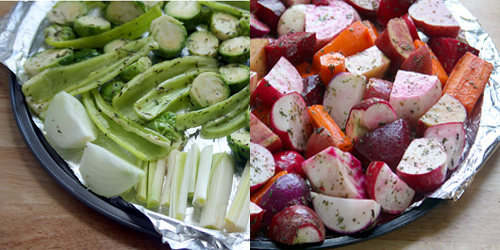 Then arrange the veggies in a single level on a foil lined baking sheet. Repeat with the veggies that need a longer cook time. I should note, I don't toss the onion or the leeks because they fall apart and become too small and then they dry out and burn rather than roast. Instead I just put them on the roasting sheet with no oil or spices. Set your oven to broil and put your veggies in the oven. After 5 minutes switch your veggies from top to bottom. Broil for another 5 minutes. Check your veggies that don’t need much time to cook. They should be a nice roasted golden brown (if they aren't go for another round of broiling). Once nicely browned pull them from the oven. Reduce your temperature to 350 and bake the veggies that need a longer time to cook an additional 20-25 minutes or until a knife easily cuts into the carrot. Turn the oven off and put both sheets of veggies back in the oven to keep them warm until the polenta is done and has cooled for 5 minutes. Polenta is one of my all time favorites! I love how you've roasted the vegetables to serve with it! I usually saute mushrooms and serve them on top, now I have another option that I didn't even think of, thank you! though we are not into polenta but I love the roasted vegs, nice. That looks amazing! What a great meal. I love all the roasted veggies! mmm this looks really yummy. I would never have thought to do this before so thanks :) i love new food ideas!! You have such a variety of beautiful roasted veggies in this meal. I have never roasted radishes before, but I will now. Great meal! This is a gorgeous dish! I love all those roasted veggies! I love polenta--still trying to convert my husband. Maybe he will like this style where it goes NEXT to the veggies. A combination of my favorite things in the world, especially now that it is fall! Fantastic! I love that you used two different types of corn. I'm a huge fan of polenta and it's amazing how easy it is to make...BUZZED! I just started using the finer grain cornmeal, I think that it makes a creamier polenta. I just made polenta with blistered tomatoes and it tasted great. 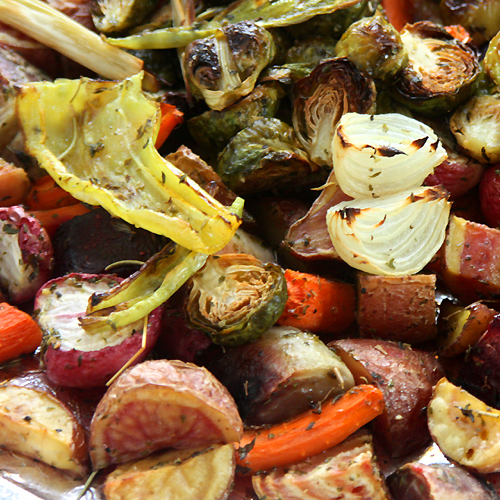 Your roasted vegetables make the dish look much more colorful! Wow, those vegetables just look fantastic! The colors are so beautiful and rich :) Great recipe, thanks for sharing. Hope you have a wonderful day! Beautiful photos and even more beautiful food! 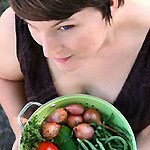 Your veggies look absolutely fabulous. I could make a meal out of these alone. This looks like a great meal, especially with me being a vegetarian. Thanks for sharing!